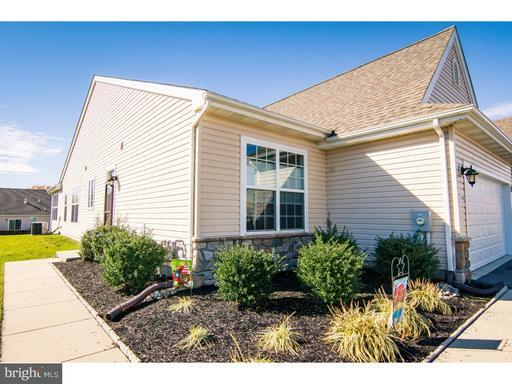 Beautiful 2 Bedroom 2 Bath end unit carriage home in the 55+ Community has been meticulously cared for and is now available! This home has an open floor plan that flows from foyer to kitchen to a beautiful and serene sunroom with New French Doors. Natural light is abundant through this entire home and adds to the open and airy atmosphere. Upgrades include quite-technology ceiling fans, stainless steel appliances and recessed lighting through the common areas. The master bedroom is spacious and includes dual walk-in closets that lead to a master bathroom with dual vanity sink and plenty of storage space. This community includes a walk-trail, cutting-edge clubhouse with outdoor pool, fitness center, bocce court and activity rooms and kitchen. This home is move-in ready and awaits your tour.